Newly arrived in New York City, I’ve been doing a lot of walking. Browsing vintage stores in Williamsburg, getting cultured at the Met, shopping in Soho, soaking in the fabled street life of the West Village, admiring the Manhattan skyline from the Brooklyn waterfront, I could go on. The importance of walkability is becoming increasing recognised, but with all that walking, sometimes you just need a place to stop, to rest, and to watch the world go by. Luckily for us weary wanderers, there is an abundance of informal seating available on the streets of New York. From plastic chairs outside a noodle shop to a bespoke wooden bench built around a street tree - once you start noticing street seats you suddenly start seeing them everywhere. This trend inspired Street Plans Collaborative to launch Street Seats, an open source project to map New York’s informal public seating. The aim of the project is to raise awareness of the positive impact of something as simple as providing a seat, and to inspire more people to get involved in improving public space in their neighbourhood. In conjunction with Neighborland, Street Plans Collaborative hosted a mapping party last weekend to build up the database of locations across the city. We met up on a sunny afternoon in Union Square and went over the rules of what does and does not constitute a street seat – not a park bench or street furniture provided by the government, not outdoor cafe seating, we were interested only in seats provided by businesses, community groups or individuals as a gift to the city. Armed with smartphone cameras we then fanned out to tackle different neighbourhoods across the city, uploading geotagged photos as we went. My group managed to find over 20 street seats in Chinatown and Little Italy, with the mapping party resulting in over 100 new additions to the database across the city. Not bad for an afternoon’s work! Regrouping in a bar later to discuss our findings, we discovered that while we had expected most seats to be associated with cafes and restaurants, they also included such diverse offerings as marble benches outside a church, a ‘customers only’ seat outside a cigar shop, to even a bench outside a bail bonds office! While there were some beautiful handcrafted artisan pieces, there were also simple utilitarian designs, and the seats didn’t necessarily have to be elaborate to be effective. An interesting trend was that street seats tended to be clustered together, suggesting that seeing the success of one example inspired other people to get involved too – exactly the process which streetseats.org aims to encourage in the digital realm. Are there any DIY street seats in your neighbourhood? "Rap Quotes" is a new guerrilla street sign project created by Jay Shells that references particular street corners mentioned in rap lyrics. Shells, a graphic designer, urban interventionist and lover of hip hop decided that rap lyrics should be celebrated in the birthplace of hip hop- New York City. 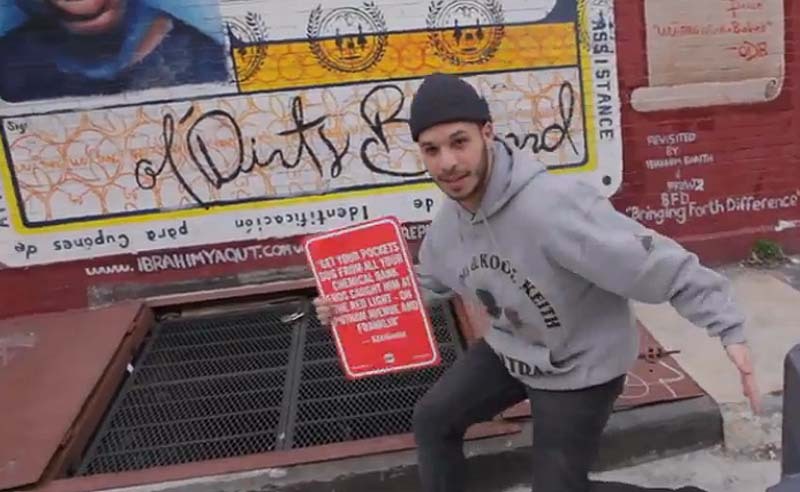 He carefully crafted street signs with the lyrics of some of the most famous rappers (Jay-Z, Kanye West, Mos Def, Busta Rhymes and Nas to name a few) and put them in what can be argued are 'historical' locations. What started off as a small-scale idea, turned into a project consisting of over 30 signs scattered across New York City. This project is the first of it’s kind, but it will be interesting to monitor if imitation projects pop-up in other world cities. The possibilities for a London, Paris, LA edition are endless. Technological advancements have cast doubt on the longevity of some industries and services. No other piece of public space is as threatened by this change as the public library. However, book lovers around the world are proving that it doesn’t take much to start a library- just a few shelves and some books. These informal libraries are a frequent meeting place for backpackers across South East Asia. Trending City previously highlighted the use of the iconic phone booth serving as public libraries across the UK and now this movement is prevalent in many North American Cities. 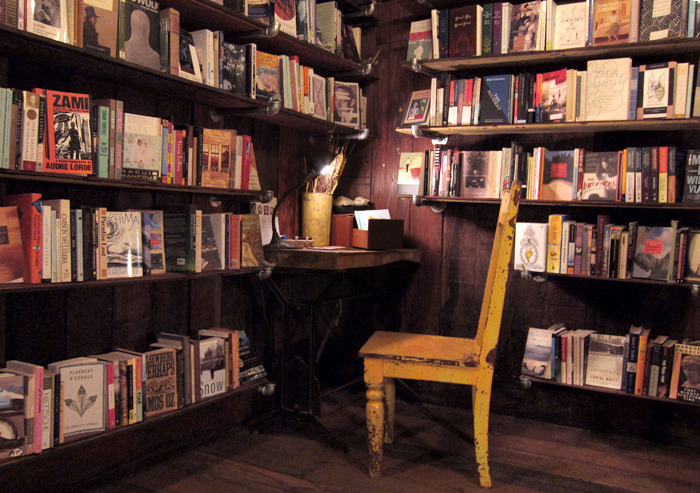 Ourshelves is a lending library located in San Francisco. This library is open to anyone, no matter how little they can pay or where they live. The goal was to provide places where reading material is often hard to find with access to books. The results are impressive: over 3,000 books have been borrowed and there have been virtually no theft or misplaced books. Ourshelves, plans to expand their network to safe houses, shelters and other underutilized public spaces around the San Francisco Area. As a result, it joins other innovative book lending efforts, such as Little Free Library in demonstrating that a library can be created out of almost anything. 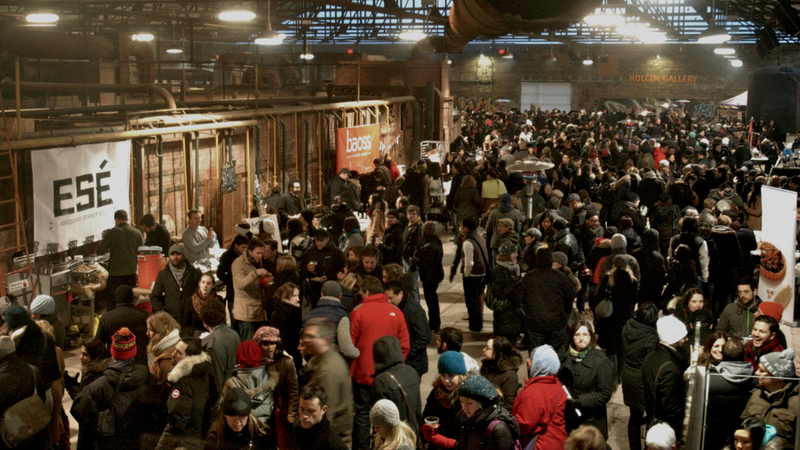 Many North American cities have embraced pop-up food markets with wide-open arms. Toronto’s Underground Market holds monthly pop-ups at Evergreen Brick Works, a pop-up market emerged underneath New York’s famous High Line and San Diego has just implemented its first food market at the beginning of 2013 on National Avenue. It bears the question- what is so attractive about pop-up food markets? Is the allure the interesting spaces and locations that these events are held? Is there widespread desire to sample unique food from various restaurants and vendors? Or is it the knowledge that the market may not exist next year, next month or even next week that draws crowds to pop-up markets? Maybe it’s all of the above. Pop-up markets create a platform for existing and emerging food vendors to showcase their skills to their peers, critics and admirers. In many cases, these events serve as job-interviews for many aspiring chefs. It also provides restaurants with an opportunity to test and obtain feedback on new recipes. Furthermore, pop-up markets are increasingly attracting foodies from diverging backgrounds. These events provide opportunities for differing social groups to bond over their love for fish tacos. And who knows, maybe bond over other things? While the economic and social justifications for pop-up markets can be disputed, what is indisputable is the fact that these events are delicious, affordable, fun and here to stay. Public spaces are increasingly being designed to not only look great but also foster an element of activity, engagement and interaction. Trending worldwide, new examples of interactive public spaces (both temporary and permanent) include, Millennium Park in Chicago, Sky Mirror in Sydney and Water Light Graffiti in Poitiers. Millennium Park is the centre piece of Chicago. The park is highly interactive and is a key attraction for both residents and tourists. One of the key sculptures, Cloud Gate by Anish Kapoor (or as I refer to it, the 'Jelly Bean'), provides endless opportunities to photograph your reflection or the reflection of the Chicago skyline and provides a distorted reality. The sculpture was intriguing and provided me with many opportunities to not only engage with my friends but also other people who were exploring the Jelly Bean. Another popular attraction in Millennium Park is the Crown Fountain. 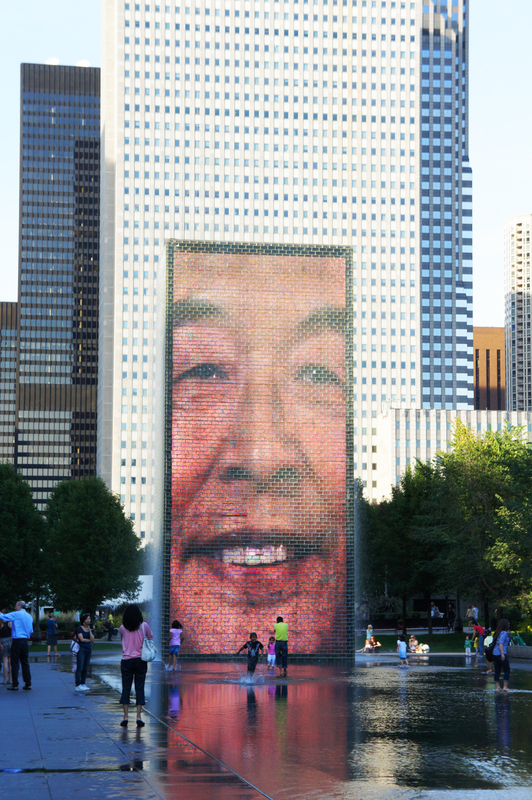 During the day the two glass brick towers project images of faces on their LED displays. The faces continue to change and squirt out water through a water nozzle. The artwork attracts people of all ages to play in the fountain, particularly on hot days. Another interactive installation involving water and LEDs was Water Light Graffiti which was temporarily displayed in Poitiers in France. This installation has taken interactive public spaces one step further by giving the design powers back to the public. 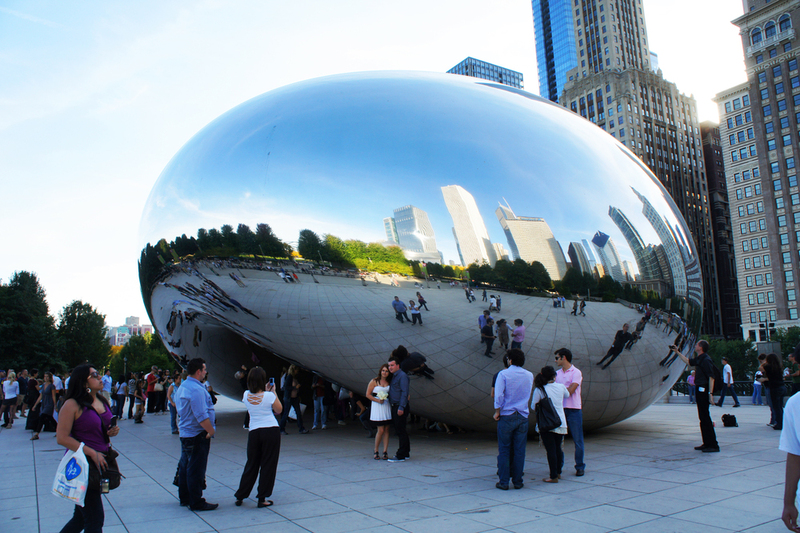 Kapoor's public experiements are not only limited to Chicago but can be found across the world. In Sydney, the Museum of Contemporary Art is currently exhibiting a number of Annish Kapoor’s artworks and sculptures. Kapoor experiments with a range of materials, however his works are recognisable for their scale and impact. The Sky Mirror, which is currently located at the front of the MCA, was previously located outside the Rockafellar Centre in New York and provides tourists and visitors to the MCA with opportunities to experience Kapoor’s ingenious sculptures and distort reality. Large artistic installations create interactive public spaces which are not only trending but are successfully producing vibrant attractions within large cities. Look out for temporary public installations or even permanent ones in a city near you! Cloud Gate, Millenium Park. Image courtesy of Laura Schmahmann. Cloud Gate, Millennium Park. Image courtesy of Laura Schmahmann. Crown Fountain, Millennium Park. Image courtesy of Laura Schmahmann.